Citation Information: J Clin Invest. 2011;121(9):3635-3644. https://doi.org/10.1172/JCI45790. Protein tyrosine phosphatase nonreceptor type 22 (PTPN22) gene polymorphisms are associated with many autoimmune diseases. The major risk allele encodes an R620W amino acid change that alters B cell receptor (BCR) signaling involved in the regulation of central B cell tolerance. To assess whether this PTPN22 risk allele affects the removal of developing autoreactive B cells, we tested by ELISA the reactivity of recombinant antibodies isolated from single B cells from asymptomatic healthy individuals carrying one or two PTPN22 risk allele(s) encoding the PTPN22 R620W variant. We found that new emigrant/transitional and mature naive B cells from carriers of this PTPN22 risk allele contained high frequencies of autoreactive clones compared with those from non-carriers, revealing defective central and peripheral B cell tolerance checkpoints. Hence, a single PTPN22 risk allele has a dominant effect on altering autoreactive B cell counterselection before any onset of autoimmunity. In addition, gene array experiments analyzing mature naive B cells displaying PTPN22 risk allele(s) revealed that the association strength of PTPN22 for autoimmunity may be due not only to the impaired removal of autoreactive B cells but also to the upregulation of genes such as CD40, TRAF1, and IRF5, which encode proteins that promote B cell activation and have been identified as susceptibility genes associated with autoimmune diseases. These data demonstrate that early B cell tolerance defects in autoimmunity can result from specific polymorphisms and precede the onset of disease. Altered central B cell tolerance checkpoint in healthy individuals carrying PTPN22 risk allele(s). (A) Antibodies from new emigrant/transitional B cells from healthy donors who did not carry the PTPN22 risk allele (HD-CC) or carried one (HD-CT) or two (HD-TT) PTPN22 risk allele(s) were tested by ELISA for reactivity against ssDNA, dsDNA, insulin and LPS. Polyreactive antibodies reacted against all 4 antigens. Dotted lines show ED38-positive control (5). Horizontal lines show cutoff OD405 for positive reactivity. For each individual, the frequency of polyreactive and non-polyreactive clones is summarized in pie charts, with the number of antibodies tested indicated in the center. The frequencies of polyreactive (B) and anti-nuclear (C) new emigrant/transitional B cells are compared between healthy donors carrying or not carrying PTPN22 risk allele(s), and statistically significant differences are indicated. Each diamond represents an individual, and the horizontal bars show the average. 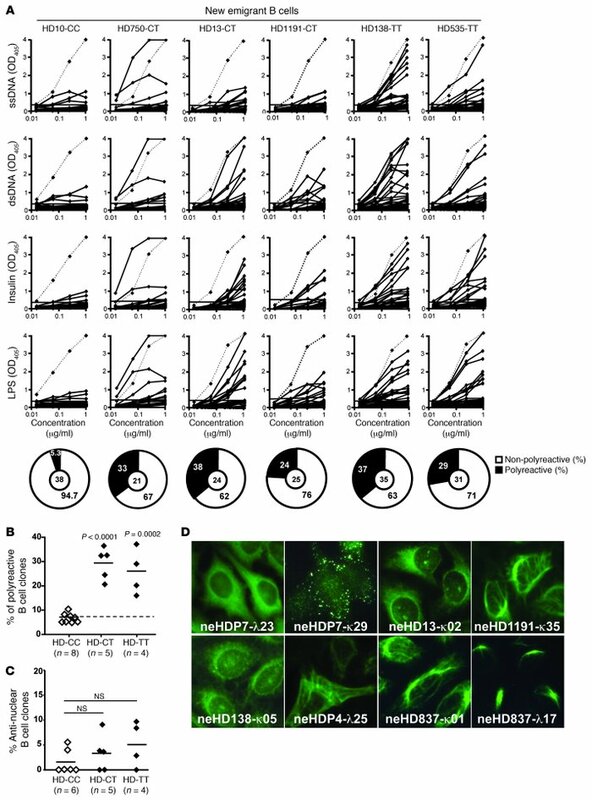 (D) Autoreactive antibodies expressed by new emigrant (ne) B cells from PTPN22 risk allele carriers mostly show various cytoplasmic patterns of HEp-2 staining. Original magnification, ×40.